There are many things one could say about the sad and troubled life of Gerry Conlon, whose tragically premature death from cancer has just been announced, and the cruel miscarriage of justice that cost his father his life and himself so many years of imprisonment for an offence he had nothing to do with. But for the time being I would like to confine my reaction to the role of the Irish media in the story of Gerry Conlon and the Guildford Four. 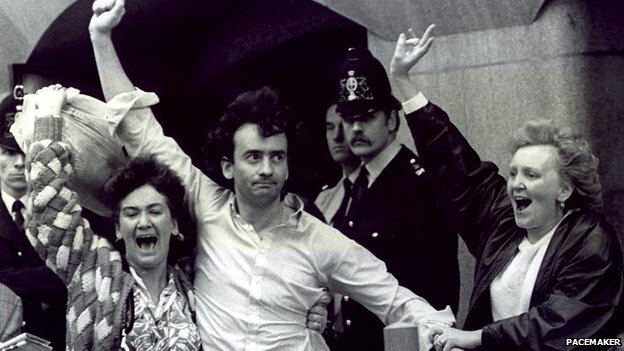 Gerry Conlon celebrates his acquittal outside the Old Bailey with his two sisters in 1989. Notice the unhappy-looking policemen in the background. In the next few days we will, I am sure, be treated to acres of coverage from Ireland about how awful the treatment of the Guildford Four was at the hands of British justice, how pernicious was the climate of anti-Irish racism in England in the 1970’s and how corrupt was the British police service. All true of course but one thing you will not hear from the Irish media is that at the time that Gerry Conlon and his father, Guiseppe were sent to jail, not one major newspaper or electronic media outlet would have had the courage to have even thought of saying such things. The truth is that after their conviction a disgraceful silence descended on mainstream Irish newspapers’ and RTE coverage of the Guildford Four’s concocted conviction that was extended to the Birmingham Six, the Maguire Five and Judith Ward. The Irish media’s shameful and contemptible shunning of this extraordinary catalogue of judicial corruption lasted during all of the 1970’s and most of the 1980’s. I began my career in journalism not long after the conviction of the Guildford Four and already it was clear that there was evidence of a serious and scandalous miscarriage of justice that cried out to be probed by the media. But in those days to write that people like Gerry Conlon might be innocent, or to suggest that the Birmingham Six might have been framed, or that the notion that Anne Maguire, a member of her local Conservative Party Club in London, lived a secret life as an IRA bomber was sheer nonsense, was tantamount to an admission of IRA membership and was fatal for the career of an ambitious Irish reporter. So mainstream Irish journalists – and here I am talking primarily of the Dublin-based media – learned to keep away from such stories. There were exceptions of course. Hibernia magazine, for which I then worked was one, as was Vincent Browne’s Magill magazine and there were many individual journalists who tried to get the story out but ran up against a brick wall of Irish media cowardice. The vast bulk of editors and media chiefs just would not give space to a story that even suggested that the IRA might be right to complain about British justice. Instead, as with so many controversial stories during the Troubles, it was left to the Brits to do the decent thing, especially those who worked in current affairs television. And so World in Action, Yorkshire TV, Thames’ This Week and the BBC’s Panorama amongst many others did the job that the Irish media was too timid and spineless to do. It was stalwart work by British lawyers, most of them left wing or progressive, which secured the acquittal of Gerry Conlon and his confreres as well as the Birmingham Six and others, but the British television media set the tone that made it all possible. It is a fundamental truth of the story of the Troubles that the British media often did what most of their Irish counterparts were too craven and yellow-bellied to even contemplate. If the story had been left to the Irish media to cover, Gerry Conlon would have died in a prison cell. my posting nick, was a blast at the dublin bit of the irish media only, i.e. the mainstream dailies and RTE. if that wasn’t clear i apologize. yourselves and others coming from a similar angle on the british side of the border knew instinctively what was happening with gerry conlon and others and treated the story appropriately. Its no excuse, but the Irish media were financially dependent on English business for advertising revenue, which would have dried up immediately had they been doing the decent thing. Money will always trump principles. you still haven’t said who you are. why not? as far as your comment is concerned it is absolute nonsense, like most of your contributions to this blog. i wrote that the british media exposed the injustices of the guildford four when the irish media would not. your explanation is that irish media’s dependence on british ad revenues explains why this happened. but what about the british media? weren’t they more dependent on british ad revenue than the irish? yet that didn’t stop them. duh!! No doubt the same ‘craven’ yellowbellies are now the first to slander anyone challenging Sinn Fein as an enemy of the the peace process. I imagine the irony isn’t lost on you? no doubt about that. notice the complete silence in the media, the guardian excepted, about allegations of provo bugging of the mcintyres!